Roman trade with India according to the Periplus Maris Erythraei 1st century CE. Roman gold coins excavated in Pudukottai, India. One coin of Caligula (31-41 CE), and two coins of Nero (54-68). British Museum. 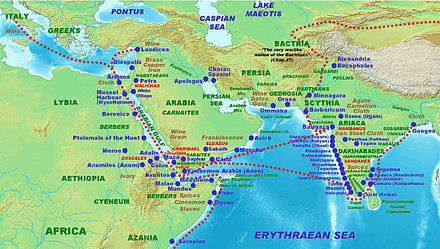 Roman trade with India (see also the spice trade and incense road) through the overland caravan routes via Anatolia and Persia, though at a relative trickle compared to later times, antedated the southern trade route via the Red Sea and monsoons which started around the beginning of the Common Era (CE) following the reign of Augustus and his conquest of Egypt in 30 BCE. The route so helped enhance trade between ancient states of India and Rome, that Roman politicians and historians are on record decrying the loss of silver and gold to buy silk to pamper Roman wives, and the southern route grew to eclipse and then totally supplant the overland trade route. Roman and Greek traders frequented the ancient Tamil country (present day Southern India) and Sri Lanka, securing trade with the seafaring Tamil states of the Chola, Pandyan and Chera dynasties and establishing trading settlements which secured trade with India by the Greco-Roman world since the time of the Ptolemaic dynasty a few decades before the start of the Common Era and remained long after the fall of the Western Roman Empire. They also outlasted Byzantium's loss of the ports of Egypt and the Red Sea (ca. 639-645 CE) under the pressure of the Muslim conquests. Sometime after the sundering of communications between the Axum and Eastern Roman Empire in the 7th century, the Christian kingdom of Axum fell into a slow decline, fading into obscurity in western sources. It survived, despite pressure from Islamic forces, until the 11th century, when it was reconfigured in a dynastic squabble. The Seleucid and the Ptolemaic dynasties controlled trade networks to India before the establishment of Roman Egypt. Trans-Saharan trade requires travel across the Sahara to reach sub-Saharan Africa. While existing from prehistoric times, the peak of trade extended from the 8th century until the late 16th century. The Sahara once had a very different environment. In Libya and Algeria, from at least 7000 BC, there was pastoralism, herding of sheep and goats, large settlements and pottery. Cattle were introduced to the Central Sahara (Ahaggar) from 4000 to 3500 BCE. Remarkable rock paintings (dated 3500 to 2500 BC) in currently very dry places portray vegetation and animal presence rather different from modern expectations. The Sahara is a hostile expanse that separates the Mediterranean economy from the economy of the Niger basin. Fernand Braudel pointed out, such a zone, like the Atlantic Ocean, is only worth crossing in exceptional circumstances, when the gain outweighs the loss. However, unlike the Atlantic, the Sahara has always been home to groups of people practising trade on a local basis. Trade in Islamic times was conducted by caravans of camels. These camels would be fattened for a number of months on the plains of either the Maghreb or the Sahel before being assembled into a caravan. According to Ibn Battuta, the explorer who accompanied one of the caravans, the average size per caravan was a 1,000 camels; some caravans were as large as 12,000. The caravans would be guided by highly paid Berbers who knew the desert and could ensure safe passage from their fellow desert nomads. The survival of a caravan was precarious and would rely on careful coordination. Runners would be sent ahead to oases so that water could be shipped out to the caravan when it was still several days away, as the caravans could not carry enough with them to make the full journey. Prehistoric trade spanned the northeastern corner of the Sahara in the Naqadan era. Predynastic Egyptians in the Naqada I period traded with Nubia to the south, the oases of the western desert to the west, and the cultures of the eastern Mediterranean to the east. They also imported obsidian from Ethiopia to shape blades and other objects. The overland route through the Wadi Hammamat from the Nile to the Red Sea was known as early as predynastic times; drawings depicting Egyptian reed boats have been found along the path dating to 4000 BC. Ancient cities dating to the First Dynasty of Egypt arose along both its Nile and Red Sea junctions, testifying to the route's ancient popularity. It became a major route from Thebes to the Red Sea port of Elim, where travelers then moved on to either Asia, Arabia or the Horn of Africa. Records exist documenting knowledge of the route among Senusret I, Seti, Ramesses IV and also, later, the Roman Empire, especially for mining. The Darb el-Arbain trade route, passing through Kharga in the south and Asyut in the north, was used from as early as the Old Kingdom for the transport and trade of gold, ivory, spices, wheat, animals and plants. Later, Ancient Romans would protect the route by lining it with varied forts and small outposts, some guarding large settlements complete with cultivation. Described by Herodotus as a road "traversed ... in forty days", it became by his time an important land route facilitating trade between Nubia and Egypt, and subsequently became known as the Forty Days Road. From Kobbei, 25 miles north of al-Fashir, the route passed through the desert to Bir Natrum, another oasis and salt mine, to Wadi Howar before proceeding to Egypt. The Darb el-Arbain trade route was the easternmost of the central routes. The westernmost of the three central routes was the Ghadames Road, which ran from the Niger River at Gao north to Ghat and Ghadames before terminating at Tripoli. Next was the easiest of the three routes: the Garamantean Road, named after the former rulers of the land it passed through and also called the Bilma Trail. The Garamantean Road passed south of the desert near Murzuk before turning north to pass between the Alhaggar and Tibesti Mountains before reaching the oasis at Kawar. From Kawar, caravans would pass over the great sand dunes of Bilma, where rock salt was mined in great quantities for trade, before reaching the savanna north of Lake Chad. This was the shortest of the routes, and the primary exchanges were slaves and ivory from the south for salt. The western routes were the Walata Road, from the Sénégal River, and the Taghaza Trail, from the Mali River, which had their northern termini at the great trading center of Sijilmasa, situated in Morocco just north of the desert. The growth of the city of Aoudaghost, founded in the 5th century BCE, was stimulated by its position at the southern end of a trans Saharan trade route. To the east, three ancient routes connected the south to the Mediterranean. The herdsmen of the Fezzan of Libya, known as the Garamantes, controlled these routes as early as 1500 BC. From their capital of Germa in the Wadi Ajal, the Garamantean Empire raided north to the sea and south into the Sahel. By the 4th century BC, the independent city-states of Phoenecia had expanded their control to the territory and routes once held by the Garamantes. Shillington states that existing contact with the Mediterranean received added incentive with the growth of the port city of Carthage. Founded c. 800 BCE, Carthage became one terminus for West African gold, ivory, and slaves. West Africa received salt, cloth, beads, and metal goods. Shillington proceeds to identify this trade route as the source for West African iron smelting. Trade continued into Roman times. Although there are Classical references to direct travel from the Mediterranean to West Africa (Daniels, p. 22f), most of this trade was conducted through middlemen, inhabiting the area and aware of passages through the drying lands. The Legio III Augusta subsequently secured these routes on behalf of Rome by the 1st century AD, safeguarding the southern border of the empire for two and half centuries. Herodotus had spoken of the Garamantes hunting the Ethiopian Troglodytes with their chariots; this account was associated with depictions of horses drawing chariots in contemporary cave art in southern Morocco and the Fezzan, giving origin to a theory that the Garamantes, or some other Saran people, had created chariot routes to provide Rome and Carthage with gold and ivory. However, it has been argued that no horse skeletons have been found dating from this early period in the region, and chariots would have been unlikely vehicles for trading purposes due to their small capacity. The earliest evidence for domesticated camels in the region dates from the 3rd century. 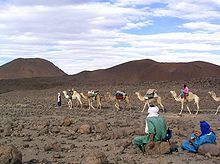 Used by the Berber people, they enabled more regular contact across the entire width of the Sahara, but regular trade routes did not develop until the beginnings of the Islamic conversion of West Africa in the 7th and 8th centuries. Two main trade routes developed. The first ran through the western desert from modern Morocco to the Niger Bend, the second from modern Tunisia to the Lake Chad area. These stretches were relatively short and had the essential network of occasional oases that established the routing as inexorably as pins in a map. Further east of the Fezzan with its trade route through the valley of Kaouar to Lake Chad, Libya was impassable due to its lack of oases and fierce sandstorms. A route from the Niger Bend to Egypt was abandoned in the 10th century due to its dangers. The rise of the Ghana Empire, centered on what is now Mali, Senegal, and southern Mauritania, paralleled the increase in trans-Saharan trade. Mediterranean economies were short of gold but could supply salt, taken by places like the African salt mine of Taghaza, whereas West African countries like Wangara had plenty of gold but needed salt. The trans-Saharan slave trade was also important because large numbers of Africans were sent north, generally to serve as domestic servants or slave concubines. The West African states imported highly trained slave soldiers. It has been estimated that from the 10th to the 19th century some 6,000 to 7,000 slaves were transported north each year. Perhaps as many as nine million slaves were exported along the trans-Saharan caravan route. Several trade routes became established, perhaps the most important terminating in Sijilmasa and Ifriqiya in what is now Morocco to the north. There, and in other North African cities, Berber traders had increased contact with Islam, encouraging conversions, and by the 8th century, Muslims were traveling to Ghana. Many in Ghana converted to Islam, and it is likely that the Empire's trade was privileged as a result. 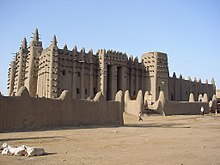 Around 1050, Ghana captured Aoudaghost, but new goldmines around Bure reduced trade through the city, instead benefiting the Soso, who later founded the Mali Empire. Unlike Ghana, Mali was a Muslim kingdom, and under it, the gold - salt trade continued. Other, less important trade goods were slaves, kola nuts from the south and slave beads and cowry shells from the north (for use as currency). It was under Mali that the great cities of the Niger bend —including Gao and Djenné— prospered, with Timbuktu in particular becoming known across Europe for its great wealth. Important trading centers in southern West Africa developed at the transitional zone between the forest and the savanna; examples include Begho and Bono Manso (in present-day Ghana) and Bondoukou (in present-day Côte d'Ivoire). Western trade routes continued to be important, with Ouadane, Oualata and Chinguetti being the major trade centres in what is now Mauritania, while the Tuareg towns of Assodé and later Agadez grew around a more easterly route in what is now Niger. The eastern trans-Saharan route led to the development of the long lived Kanem-Bornu empire centred on the Lake Chad area. This trade route was somewhat less efficient and only rose to great prominence when there was turmoil in the west such as during the Almohad conquests. The Portuguese journeys around the West African coast opened up new avenues for trade between Europe and West Africa. By the early 16th century, European trading bases, the "Factories" established on the coast since 1445, and trade with the wealthier Europeans became of prime importance to West Africa. North Africa had declined in both political and economic importance, while the Saharan crossing remained long and treacherous. However, the major blow to trans-Saharan trade was the battle of Tondibi of 1591-2. Morocco sent troops across the Sahara and attacked Timbuktu, Gao and some other important trading centres, destroying buildings and property and exiling prominent citizens. This disruption to trade led to a dramatic decline in the importance of these cities and resulting animosity reduced trade considerably. Although much reduced, trans-Saharan trade continued. But trade routes to the West African coast became increasingly easy, particularly after the French invasion of the Sahel in the 1890s and subsequent construction of railways to the interior. A railway line from Dakar to Algiers via the Niger bend was planned but never constructed. With the independence of nations in the region in the 1960s, the north–south routes were severed by national boundaries. National governments were hostile to Tuareg nationalism and so made few efforts to maintain or support trans-Saharan trade, and the Tuareg Rebellion of the 1990s and Algerian Civil War further disrupted routes, with many roads closed. Traditional caravan routes are largely void of camels, but the shorter Azalai routes from Agadez to Bilma and Timbuktu to Taoudenni are still regularly - if lightly - used. Some members of the Tuareg still use the traditional trade routes, often traveling 1,500 miles and six months out of every year by camel across the Sahara trading in salt carried from the desert interior to communities on the desert edges. The African Union and African Development Bank support the Trans-Sahara Highway from Algiers to Lagos via Tamanrasset which aims to stimulate trans-Saharan trade. The route is paved except for a 200 km section in northern Niger, but border restrictions still hamper traffic. Only a few trucks carry trans-Saharan trade, particularly fuel and salt. Three other highways across the Sahara are proposed: for further details see Trans-African Highways. ^ Shaw, Ian (2002). The Oxford History of Ancient Egypt. Oxford, England: Oxford University Press. p. 61. ISBN 0-500-05074-0. ^ a b c Please refer to Wadi Hammamat#Trade route. ^ Please refer to Wadi Hammamat#Carvings. ^ Please refer to Wadi Hammamat#Quarries and Wadi Hammamat#Common era. ^ Jobbins, Jenny. "The 40 days' nightmare", in Al-Ahram, 13–19 November 2003, Issue No. 664. Published in Cairo, Egypt. ^ Please refer to Kharga Oasis. ^ Smith, Dr. Stuart Tyson. Nubia: History, University of California Santa Barbara, Department of Anthropology, <http://www.anth.ucsb.edu/faculty/stsmith/research/nubia_history.html>. Retrieved January 21, 2009. ^ a b c d Burr, J. Millard and Robert O. Collins, Darfur: The Long Road to Disaster, Markus Wiener Publishers: Princeton, 2006, ISBN 1-55876-405-4, pp. 6-7. ^ Shillington (1995). Page 46. ^ Daniels, Charles (1970). The Garamantes of Southern Libya. Oleander, North Harrow, Middlesex. Page 22. ^ a b Masonen, P: "Trans-Saharan Trade and the West African Discovery of the Mediterranean World." ^ Lewicki, T. (1994). "The Role of the Sahara and Saharians in Relationships between North and South". In UNESCO General History of Africa: Volume 3. University of California Press, ISBN 92-3-601709-6. ^ National Geographic (2001). Africa, Episode 2, "Desert Odyssey" (TV/Video). This episode follows a Tuareg tribe across the Sahara for six months by camel. M'hammad Sabour and Knut S. Vikør (eds), Ethnic Encounter and Culture Change, Bergen, 1997,  Google Cache Last Retrieved Jan.2005. Roman trade with India through the overland caravan routes via Anatolia and Persia, though at a relative trickle comparative to later times, antedated the southern trade route via the Red Sea and Monsoons which started around the beginning of the Common Era (CE) following the reign of Augustus and his conquest of Egypt. Having extended the Empire's reach to the upper Nile, the Romans naturally encountered the great warrior trading nation of Axum (on the Red Sea, in today's Ethiopia) which had been trading with India and Egypt for several centuries. The use of monsoon winds, which enabled a voyage safer than the long and dangerous coastal voyage, was pioneered by the seafaring Axumite kingdom and subsequently learned of by the Romans, who in any event had cordial relations with Axum and used Axum carriers in many cases. The route so helped enhance trade between ancient kingdoms of India (present day) and Rome that Roman politicians are on record decrying the loss of specie to pamper Roman wives, and the southern route grew to eclipse and then totally supplant the overland trade route. Roman trade diaspora frequented the ancient Tamil country (present day Southern India) and Sri Lanka, securing trade with the seafaring Tamil kingdoms of the Chola, Pandyan and Chera dynasties and establishing trading settlements which remained long after the fall of the Western Roman empire. They also outlasted Byzantium's loss of the Egypt and the Red Sea ports (ca. 639-645 CE) under the pressure of Jihad and Islam, which had been used to secure trade with India by the Greco-Roman world since the time of the Ptolemaic dynasty a few decades before the start of the Common Era. Sometime after the sundering of communications between the Axum and Eastern Roman Empire in the seventh century, the Christian kingdom of Axum fell onto a slow decline and faded into obscurity in western culture, though it survived despite pressure from Islamic forces until the eleventh century, when it was reconfigured in a dynastic squabble. The Seleucid dynasty controlled a developed network of trade with India which had previously existed under the influence of the Persian Achaemenid dynasty. The Greek Ptolemaic dynasty, controlling the western and northern end of other trade routes to Southern Arabia and India, had begun to exploit trading opportunities with India prior to the Roman involvement but according to the historian Strabo the volume of commerce between India and Greece was not comparable to that of later Indian-Roman trade. The Ptolemaic dynasty had developed trade with India using the Red Sea ports. With the establishment of Roman Egypt, the Romans took over and further developed the already existing trade using these ports. Prior to Roman expansion, India had established strong maritime trade with other countries. The dramatic increase in Indian ports, however, did not occur until the opening of the Red Sea by the Romans and the attainment of geographical knowledge concerning India’s seasonal monsoons. In fact, the first two centuries of the Christian era indicate this increase in trade between western India and Rome. This expansion of trade was due to the comparative peace established by the Roman Empire during the time of Augustus (23 September 63 BC – 19 August AD 1), which allowed for new explorations. Thus, archeologists, with evidence from artifacts and ancient literature, suggest that a significant commercial relationship existed between ancient western India and Rome. The west coast of India has been mentioned frequently in foreign literature, such as the Periplus Maris Erythraei. The area was noted for its severe tidal currents, turbulent waves, and rocky sea-beds. Although many ships have attempted to sail outside it in order to prevent shipwrecks, many ships were still drawn inside the gulf. As a result of the difficulties, the entrance and departure of ships were dangerous for those who possessed little sea experience. The anchors of the ship would be caught by the waves and quickly cut off, which could overturn the ship or ultimately cause a wreck. Stone anchors have been observed near Bet Dwarka, an island situated in the Gulf of Kachchh, due to these frequent shipwrecks. More importantly, the number of discovered anchors and numerous artifacts suggest that Indo-Roman trade and commerce was significant during the early centuries of the Christian era. Onshore and offshore explorations have been carried out around Bet Dwarka Island since 1983.The finds discovered include lead and stone objects buried in sediment and considered to be anchors due to their axial holes. Though it is unlikely that the remains of the shipwreck’s hull survived, offshore explorations in 2000 and 2001 have yielded seven differently-sized amphoras, two lead anchors, forty-two stone anchors of different types, a supply of potsherds, and a circular lead ingot. The remains of the seven amphoras were of a thick, course fabric with a rough surface, which was used for exporting wine and olive oil from the Roman Empire. Archeologists have concluded that most of these were wine amphoras, since olive oil was in less demand in India. Since the discoveries at Bet Dwarka are significant for the maritime history of India, archeologists have researched the resources in India. Despite the unfavorable conditions the island is situated in, the following items have made Bet Dwarka as well as the rest of western India an important place for trade. From Latin literature, Rome imported Indian tigers, rhinoceros, elephants, and serpents to use for circus shows - a method employed as entertainment to prevent riots in Rome. It has been noted in the Periplus that Roman women also wore Indian pearls and used a supply of herbs, spices, pepper, lyceum, costus, sesame oil and sugar for food. Indigo was used as a color while cotton cloth was used as articles of clothing, Furthermore, India exported ebony for fashioned furniture in Rome. The Roman Empire also imported Indian lime, peach, and various other fruits for medicine. Western India, as a result, was the recipient of large amounts of Roman gold during this time. Since one must sail against the narrow gulfs of western India, special large boats were used and ship development was demanded. At the entrance of the gulf, large ships called trappaga and cotymba helped guide foreign vessels safely to the harbor. These ships were capable of relatively long coastal cruises, and several seals have depicted this type of ship. In each seal, parallel bands were suggested to represent the beams of the ship. In the center of the vessel is a single mast with a tripod base. Apart from the recent explorations, close trade relations as well as the development of ship building were supported by the discovery of several Roman coins. On these coins were depictions of two strongly constructed masted ships. Thus, these depictions of Indian ships, originating from both coins and literature (Pliny and Pluriplus), indicate India’s development in seafaring due to the increase in Indo-Roman commerce. In addition, the silver Roman coins discovered in western India primarily come from the first, second, and fifth centuries. These Roman coins also suggest that India possessed a stable sea borne trade with Rome during first and second century AD. Land routes, during the time of Augustus, were also used for Indian embassies to reach Rome. The discoveries found on Bet Dwarka and on other areas on the western coast of India strongly indicate that there were strong Indo-Roman trade relations during the first two centuries of the Christian era. The third century A.D, however, was the demise of the Indo-Roman trade. The sea-route between Rome and India was shut down, and as a result, the trading reverted back to the time prior to Roman expansion and exploration. Indian copy of an aureus of Faustina, 2nd century CE. British Museum. The replacement of Greece by the Roman empire as the administrator of the Mediterranean basin led to the strengthening of direct maritime trade with the east and the elimination of the taxes extracted previously by the middlemen of various land based trading routes. Strabo's mention of the vast increase in trade following the Roman annexation of Egypt indicates that monsoon was known and manipulated for trade in his time. “ "minimaque computatione miliens centena milia sestertium annis omnibus India et Seres et paeninsula illa imperio nostro adimunt: tanti nobis deliciae et feminae constant. quota enim portio ex illis ad deos, quaeso, iam vel ad inferos pertinet?" "India, China and the Arabian peninsula take one hundred million sesterces from our empire per annum at a conservative estimate: that is what our luxuries and women cost us. For what percentage of these imports is intended for sacrifices to the gods or the spirits of the dead?" - Pliny, Historia Naturae 12.41.84. The three main Roman ports involved with eastern trade were Arsinoe, Berenice and Myos Hormos. Arsinoe was one of the early trading centers but was soon overshadowed by the more easily accessible Myos Hormos and Berenice. Sites of Egyptian Red Sea ports, including Alexandria and Berenice. The Ptolemaic dynasty exploited the strategic position of Alexandria to secure trade with India. The course of trade with the east then seems to have been first through the harbor of Arsinoe, the present day Suez. The goods from the East African trade were landed at one of the three main Roman ports, Arsinoe, Berenice or Myos Hormos. The Romans cleared out the canal from the Nile to harbor center of Arsinoe on the Red Sea, which had silted up. This was one of the many efforts the Roman administration had to undertake to divert as much of the trade to the maritime routes as possible. Arsinoe was eventually overshadowed by the rising prominence of Myos Hermos. The navigation to the northern ports, such as Arsinoe-Clysma, became difficult in comparison to Myos Hermos due to the northern winds in the Gulf of Suez. Venturing to these northern ports presented additional difficulties such as shoals, reefs and treacherous currents. Myos Hormos and Berenice appear to have been important ancient trading ports, possibly used by the Pharaonic traders of ancient Egypt and the Ptolemaic dynasty before falling into Roman control. The site of Berenice, since its discovery by Belzoni (1818), has been equated with the ruins near Ras Banas in Southern Egypt. However, the precise location of Myos Hormos is disputed with the latitude and longitude given in Ptolemy's Geography favoring Abu Sha'ar and the accounts given in classical literature and satellite images indicating a probable identification with Quesir el-Quadim at the end of a fortified road from Koptos on the Nile. The Quesir el-Quadim site has further been associated with Myos Hormos following the excavations at el-Zerqa, halfway along the route, which have revealed ostraca leading to the conclusion that the port at the end of this road may have been Myos Hormos. Roman piece of pottery from Arezzo, Latium, found at Virampatnam, Arikamedu (1st century CE). Musee Guimet. In India, the ports of Barbaricum (modern Karachi), Barygaza, Muziris, Korkai, Kaveripattinam and Arikamedu on the southern tip of India were the main centers of this trade. The Periplus Maris Erythraei describes Greco-Roman merchants selling in Barbaricum "thin clothing, figured linens, topaz, coral, storax, frankincense, vessels of glass, silver and gold plate, and a little wine" in exchange for "costus, bdellium, lycium, nard, turquoise, lapis lazuli, Seric skins, cotton cloth, silk yarn, and indigo". In Barygaza, they would buy wheat, rice, sesame oil, cotton and cloth. Muziris is a lost port city in the South Indian state of Kerala which was a major center of trade in Tamilakkam between the Chera Empire and the Roman Empire. Large hoards of coins and innumerable shards of amphorae found in the town of Pattanam have elicited recent archeological interest in finding a probable location of this port city. The Periplus Maris Erythraei mentions a marketplace named Poduke (ch. 60), which G.W.B. Huntingford identified as possibly being Arikamedu in Tamil Nadu, a centre of early Chola trade (now part of Ariyankuppam), about 2 miles from the modern Pondicherry. Huntingford further notes that Roman pottery was found at Arikamedu in 1937, and archeological excavations between 1944 and 1949 showed that it was "a trading station to which goods of Roman manufacture were imported during the first half of the 1st century AD". A 1st century CE Indian imitation of a coin of Augustus, British Museum. The Rome-India trade also saw several cultural exchanges which had lasting effect for both the civilizations and others involved in the trade. The Ethiopian kingdom of Aksum was involved in the Indian Ocean trade network and was influenced by Roman culture and Indian architecture. Traces of Indian influences are visible in Roman works of silver and ivory, or in Egyptian cotton and silk fabrics used for sale in Europe. The Indian presence in Alexandria may have influenced the culture but little is known about the manner of this influence. Clement of Alexandria mentions the Buddha in his writings and other Indian religions find mentions in other texts of the period. Christian and Jewish settlers from Rome continued to live in India long after the decline in bilateral trade. Large hoards of Roman coins have been found throughout India, and especially in the busy maritime trading centers of the south. The Tamilakkam kings reissued Roman coinage in their own name after defacing the coins in order to signify their sovereignty. Mentions of the traders are recorded in the Tamil Sangam literature of India. One such mention reads: "The beautiful warships of the Yavanas came to the prosperous and beautiful Muchiri (Muziris) breaking the white foams of 'Chulli', the big river, and returned with 'curry' (pepper) paying for it in gold. (from poem no. 149 of 'Akananuru' of Sangam Literature)"
Following the Roman-Persian Wars the areas under the Roman Byzantine Empire were captured by Khosrow I of the Persian Sassanian Dynasty. The Arabs, led by 'Amr ibn al-'As, crossed into Egypt in late 639 or early 640 CE. This advance marked the beginning of the Islamic conquest of Egypt and the fall of ports such as Alexandria, used to secure trade with India by the Greco Roman world since the Ptolemaic dynasty. The decline in trade saw the ancient Tamil country turn to Southeast Asia for international trade, where it influenced the native culture to a greater degree than the impressions made on Rome. The Ottoman Turks conquered Constantinople in the 15th century (1453), marking the beginning of Turkish control over the most direct trade routes between Europe and Asia. The Ottomans initially cut off eastern trade with Europe, leading in turn to the attempt by Europeans to find a sea route around Africa, spurring the Age of Discovery, and the eventual rise of Mercantilism and Colonialism. Egypt under the rule of the Rashidun, drawn on the modern state borders. ^ a b "The Geography of Strabo published in Vol. I of the Loeb Classical Library edition, 1917". http://penelope.uchicago.edu/Thayer/E/Roman/Texts/Strabo/2E1*.html. ^ a b c d Halsall, Paul. "Ancient History Sourcebook: The Periplus of the Erythraean Sea: Travel and Trade in the Indian Ocean by a Merchant of the First Century". Fordham University. http://www.fordham.edu/halsall/ancient/periplus.html. ^ a b "Search for India's ancient city". BBC. 11 June 2006. http://news.bbc.co.uk/2/hi/south_asia/4970452.stm. Retrieved 4 January 2010. Curtin, Philip DeArmond; el al. (1984). Cross-Cultural Trade in World History. Cambridge University Press. ISBN 0521269318. The Encyclopedia Americana (1989). Grolier. ISBN 0717201201. Fayle, Charles Ernest (2006). A Short History of the World's Shipping Industry. Routledge. ISBN 0415286190. Freeman, Donald B. (2003). The Straits of Malacca: Gateway Or Gauntlet?. McGill-Queen's Press. ISBN 0773525157. Holl, Augustin F. C. (2003). Ethnoarchaeology of Shuwa-Arab Settlements. Lexington Books. ISBN 0739104071. Kulke, Hermann; Dietmar Rothermund (2004). A History of India. Routledge. ISBN 0415329191. Lindsay, W S (2006). History of Merchant Shipping and Ancient Commerce. Adamant Media Corporation. ISBN 0543942538. Meri, Josef W.; Jere L. Bacharach (2006). Medieval Islamic Civilization: An Encyclopedia. Routledge. ISBN 0415966906. O'Leary, De Lacy (2001). Arabia Before Muhammad. Routledge. ISBN 0415231884. Potter, David Stone (2004). The Roman Empire at Bay: Ad 180-395. Routledge. ISBN 0415100585. Young, Gary Keith (2001). Rome's Eastern Trade: International Commerce and Imperial Policy, 31 BC-AD 305. Routledge. ISBN 0415242193.